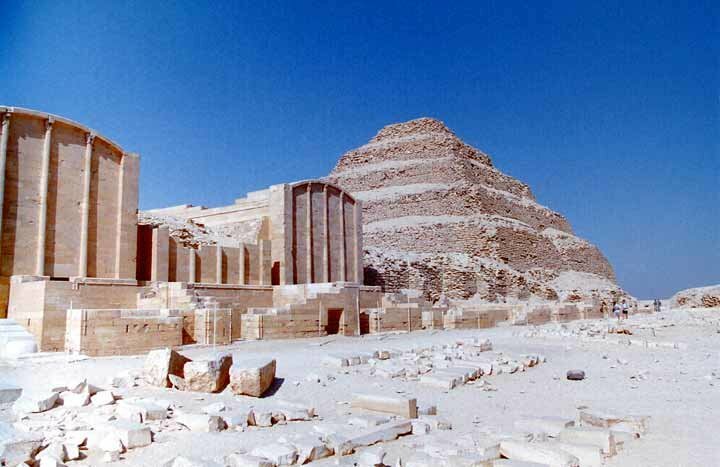 Saqqara Around 2630 B.C., in the 3rd Dynasty, a man named Djoser-Netcherikhe assumed the throne of Egypt. He made his capital just south of what is now Cairo, The Greeks called this place, Memphis. Like all pharaohs he began making preparations for his afterlife. He assigned a scholar named Imhotep the job of building his tomb. . . . . .Imhotep’s plans would incorporate many new ideas. The building material of the time was mud brick, but this would not suit a pharaoh as mighty as Djoser-Netcherikhe. Imhotep had a radical idea, he would use stone, a material never used before in large scale building projects. Originally the plan called for a mastaba tomb, a design the Egyptians had used for centuries. Imhotep had a better idea, he began stacking mastaba on top of mastaba until he realized the design of the Step Pyramid. It was a shape the ancient Egyptians recognized as the legendary mound of creation that had risen out of the primordial ocean of chaos. It was also the shape of things to come. For almost 1000 years the pharaohs built pyramids as their eternal resting places. Abandoning them when they realized that under these giant monuments of extravagant wealth, they could no longer protect their afterlives from plunder.